This print by Paul Fourdrinier is an etching. The action of acid was used to make a pattern of grooves on a copper printing plate. This image on the printing plate was the reverse of the final image. The grooves were then filled with ink and the image was transferred onto a blank sheet of paper. William Kent employed a variety of ornamental details in this design, including female masks, scrolling foliage and stylised flowers. The chimney-piece incorporates one large lion mask and two smaller animal masks lower down. 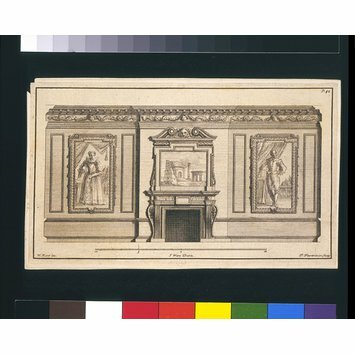 The frieze below the mantelpiece is decorated with a Greek key pattern. The two paintings on either side of the chimney-piece look like 16th-century family portraits. In long-established aristocratic families these would have been prized heirlooms. 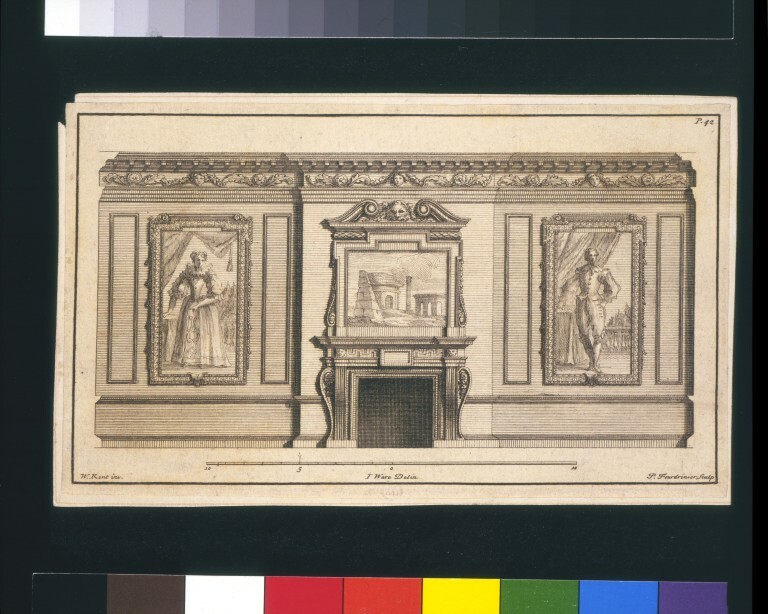 The painting above the fireplace, however, was probably obtained more recently, by a member of the family who had visited Italy on the Grand Tour. Kent has shown that he could design a harmonious architectural framework for paintings that might range from historical portraits to contemporary souvenirs of the Grand Tour. William Kent (after), plate 42 from 'The Designs of Inigo Jones and others', London 1743. (Berlin I) Berlin Staatliche Museen, Katalog der Ornamentstich-Sammlung der Staatlichen Kunstbibliothek Berlin, Berlin and Leipzig, 1936-39, 2274.